The Hawkeye state has a progressive income tax system with nine tax brackets. The state’s income tax rates range from 0.36% to 8.98%. Appanoose County also has a 1% local income tax and 339 school districts in Iowa levy surtaxes. When you start a new job, you fill out a W-4 form and the information on this form tells your employer how much to withhold in taxes from each of your paychecks. Regardless of your pay frequency, your employers will take out federal income taxes from your wages. This money goes to the IRS, who will put it toward your annual income taxes. Multiple factors affect your withholdings. Your marital and filing status is a big part of it. Whether you’re single or married; whether you’re filing jointly or separately; and whether you file as the head of the household, will all impact your income tax bracket. If you qualify as a common-law couple, you have the option to file jointly as well. If you have qualifying dependents, claiming them might increase your allowances and lower your taxes. However, be cautious in claiming too many allowances as you don’t want to underpay in taxes all year and be slapped with a massive bill come tax season. It’s worth mentioning that because of the new tax plan signed by President Trump in December 2017, withholding rates changed a bit from 2017 to 2018. If you haven’t checked yet, it’s a good idea to make sure the information in your W-4 is still correct. In addition to federal income taxes, your employer withholds 1.45% of your salary for Medicare taxes and 6.2% for Social Security taxes. Together these make up FICA taxes. If you earn in excess of $200,000, you will be charged a 0.9% Medicare surtax. Note that the FICA taxes are actually double the rate that you pay because your employer contributes an equal amount. If you are self-employed, you will have to pay the full rate of 2.9% for Medicare and 6.2% for Social Security. The good news is that when you file your taxes, there are some deductions you can take to recoup the “employer” portion. Another factor that affects the size of your paycheck is your pay frequency. If you are paid once a month, your paychecks will be bigger than if you get paid bi-weekly. Known for its rolling plains and beautiful cornfields, Iowa is home to an income tax system that ranges from one of the lowest income tax rates in the country (0.36%) to one of the highest (8.98%). The tax system is made up of nine tax brackets which are dependent upon residents' income level. The brackets remain the same for all taxpayers regardless of their marital or filing status. Iowans are taxed at 0.36% on the first $1,598 of their income; 0.72% up to $3,196; 2.43% up to $6,392; 4.5% up to $14,382; 6.12% up to $23,970; 6.48% up to $31,960; 6.8% up to $47,940; 7.92% up to $71,910; and 8.98% for income over $71,910. Appanoose County has an additional 1% in local income tax. More than 300 Iowa school districts levy a surtax that is equal to a percentage of the Iowa taxes paid by residents. If you pay $2,000 in Iowa taxes and your school district surtax is 10%, you have to pay another $200. Check the chart below for the surtax rates for the 339 Iowa school districts that levy them. There are a number of ways that you can tweak your Iowa paycheck. First of all, it’s a good idea to review your W-4 form each year. Since your W-4 form is the information that your employer uses to determine how much to withhold, you want to make sure the information is correct. If you got a huge tax bill, you may be claiming too many allowances and having too little in taxes taken out from each paycheck. If you think this is the case, fill out a new W-4 and claim fewer allowances. You can also elect to have a dollar amount withheld from each your paychecks. In this case, you write down the total you want taken from each check, say $20, on your W-4. It may seem like you are choosing to receive a smaller paycheck each month, but think of it as paying your taxes more accurately throughout the year. On the other end of the spectrum, if you got a large tax refund, you may be overpaying your taxes throughout the year. Some people might like getting a big refund once a year as it forces them to save that money, but it’s also nice to have that money in your bank account throughout the year. One option that may work for you is filling out a new W-4 and claiming more allowances. Your paycheck size will change if you take advantage of any company benefits. For example, if you get medical insurance for you and your spouse through your employer, those premiums will be paid out from your salary. Your employer may also offer pre-tax benefits. Money you put in these accounts comes out of your pay before income tax and thus it lowers how much of your salary is subject to income tax. Examples include a health savings account (HSA) or a flexible spending account (FSA). If you know you have a few fixed health expenses, for example, you can put that money aside into one of these accounts so that you have it when you need it and save on taxes along the way. One thing to note with FSAs is that only $500 will roll over from year to year, so if you don’t use the money you put in, you may lose it. Other pre-tax contributions worth considering are for retirement accounts, such as a 401(k) or 403(b). You should especially consider one of these accounts if your employer offers a matching program. 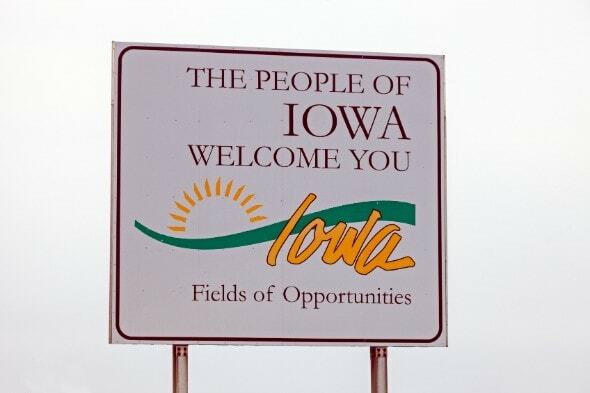 If you are planning on buying a home in the Hawkeye State, take a look at our Iowa mortgage guide for the important details about rates and the different type of loans you’ll want to consider.